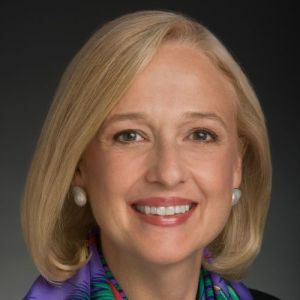 Paula A. Kerger is president and chief executive officer of PBS, the nation’s largest non-commercial media organization, with nearly 350 member stations throughout the country. Having joined PBS in March 2006, Kerger is the longest-serving president and CEO in PBS history. Under Kerger’s leadership, PBS has grown its audiences across genres and platforms. PBS has moved from the 14th most-watched network in America to number six in the past decade. Over the course of a year, 86% percent of all U.S. television households watch PBS, and each month, Americans view an average of 255 million videos across PBS’s web, mobile and connected device platforms. Since Kerger’s arrival, PBS has consistently presented high-quality, groundbreaking content that delivers on the founding mission of public television — to educate, inspire and entertain the American people. Among her accomplishments are the pop culture phenomenon “Downton Abbey” on MASTERPIECE; Ken Burns’s and Lynn Novick’s critically acclaimed The Vietnam War; the documentary Hamilton’s America, about the Broadway smash hit musical, on Great Performances; Freedom Riders on American Experience; and award-winning children’s programs such as Daniel Tiger's Neighborhood. In the past year, PBS and its producing partners have been recognized with several prestigious honors, including six Peabody Awards, four Alfred I. duPont-Columbia University Awards and seven News & Documentary Emmy Awards — more than any other organization. Kerger has made particularly strong commitments to PBS’s work in children’s education. She led the historic launch of the PBS KIDS 24/7 broadcast and streaming channel, ensuring that PBS’s educational programming can reach children anytime and anywhere through local stations. In addition, Kerger oversaw the development of PBS LearningMedia, which empowers teachers across America to engage and inspire their students with high-quality digital content. Kerger also serves as president of the PBS Foundation, an independent organization that raises private sector funding — a significant source of revenue for new projects at PBS. Kerger is regularly included in the Hollywood Reporter’s “Women in Entertainment Power 100,” an annual survey of the nation’s top women executives in media, as well as Washingtonian Magazine’s Most Powerful Women in Washington. She has been honored with the Woman of Achievement Award from Women in Development, New York; the National Education Association Friend of Education Award; and Promax/BDA, B&C and Multichannel News Brand Builder Award. In 2017, she received the Advancing American Democracy Award from the Benjamin Harrison Presidential Site. Prior to joining PBS, Kerger served for more than a decade at Educational Broadcasting Corporation (EBC), the parent company of Thirteen/WNET and WLIW21 New York, where her ultimate position was executive vice president and chief operating officer. Her tenure boasts many achievements, including WNET’s completion in 1997 of the largest successful endowment campaign ever undertaken by a public television station. Kerger received her bachelor’s degree from the University of Baltimore, where she serves on the Merrick School of Business Dean’s Advisory Council. She has received honorary doctorates from Washington University in St. Louis, Grand Valley State University, Allegheny College and Northeastern University. She is a member of the Women’s Forum, director of the International Academy of Television Arts and Sciences, a member of Meredith Corporation’s Board of Directors and chair of the board of the Smithsonian Institution’s National Museum of Natural History.